When Logitech launched its G Pro line of gaming peripherals with the introduction of the G Pro Gaming Mouse, it wasn’t surprising that the company would soon release a keyboard under the new line. So a few months later, the company unveiled the G Pro Tenkeyless Mechanical Gaming Keyboard. Just like the G Pro mouse, the G Pro keyboard was designed with professional gamers and esports fans in mind; hence going with a simple, straightforward, tenkeyless design that’s packed with features that both pro gamers and their fans would appreciate. The tenkeyless form factor of the G Pro makes it suitable for those who want to be able to easily bring around their keyboard for playing outside of the comforts of their home – such as LAN parties, events, and tournaments. 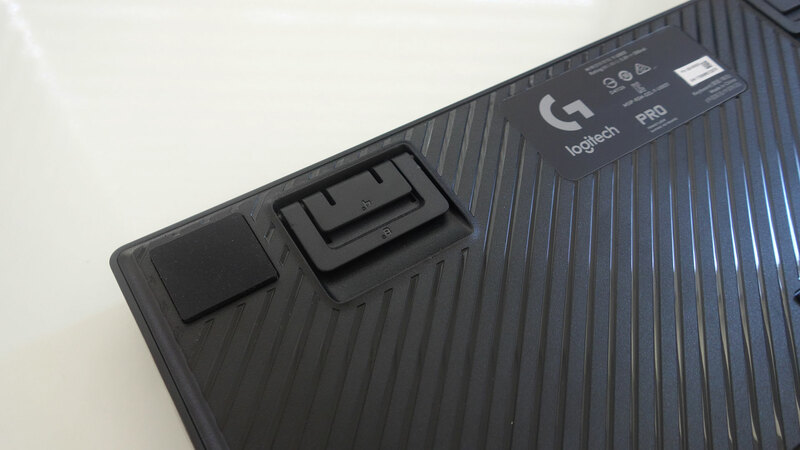 The keyboard features no additional macro keys and minimal bezels save for the top bezel which features the Logitech G logo, the notification LEDs, as well as round gaming mode and LED control buttons. The keyboard measures only 153 x 360 x 34.3mm and weighs around 980 grams, making it an incredibly compact and lightweight keyboard. 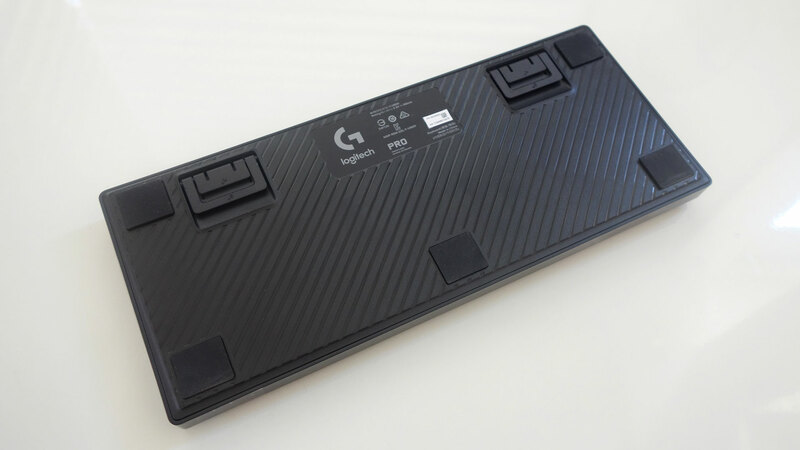 The G Pro keyboard follows the same design ethos of the previously released G610 Orion and the more recently released G413 Carbon, with its simple and clean frame with slightly curved corners. Most of the body comes in a matte black while the sides of the frame are glossy with the PRO designation labeled on the right side. The bottom of the keyboard has angled ribs that run diagonally across the width of the keyboard. 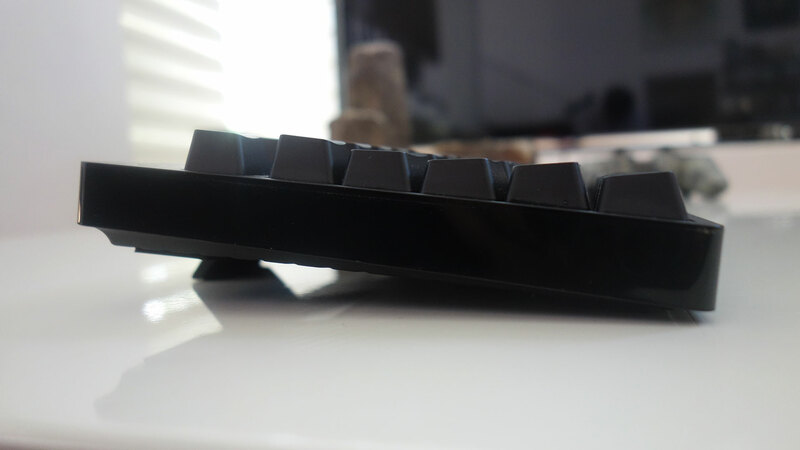 There’s also five large rubber pads that will assure that the keyboard stays in place and two sets of feet to raise the rear of the keyboard either four or eight degrees. The G Pro is definitely one of the best looking tenkeyless mechanical gaming keyboards we’ve seen so far. 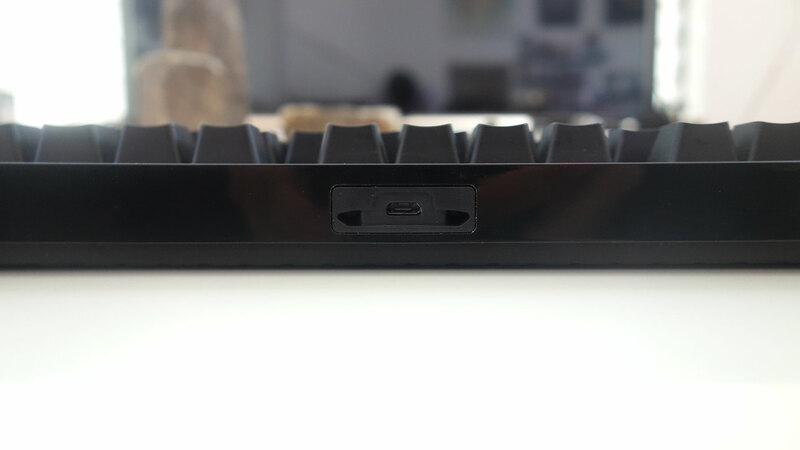 The rear of the keyboard features the port where the detachable USB cable be connected to. 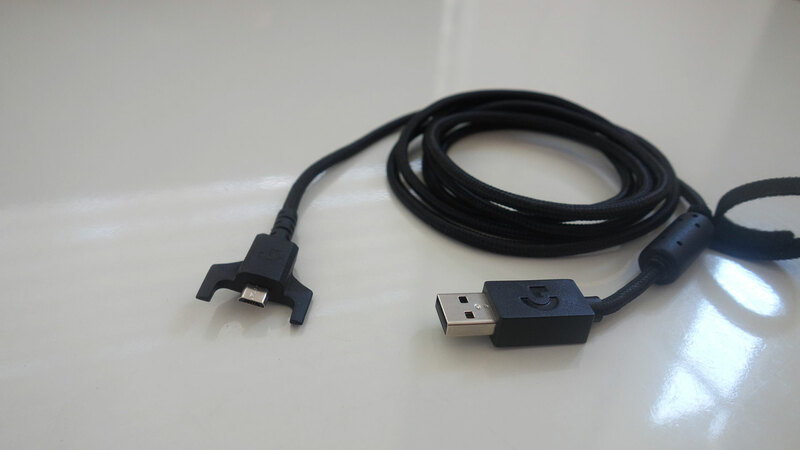 The port and the cable features a three-pronged design (something the company also uses on its G900 series mice) which has two plastic support arms or wings and the actual USB connector. The design ensures that the cable stays secure to prevent it from both detaching accidentally or wobbling, which will wear out the port faster. Some third-party USB cables may fit in the port and work with the G Pro but they won’t have the supports to keep it secure. 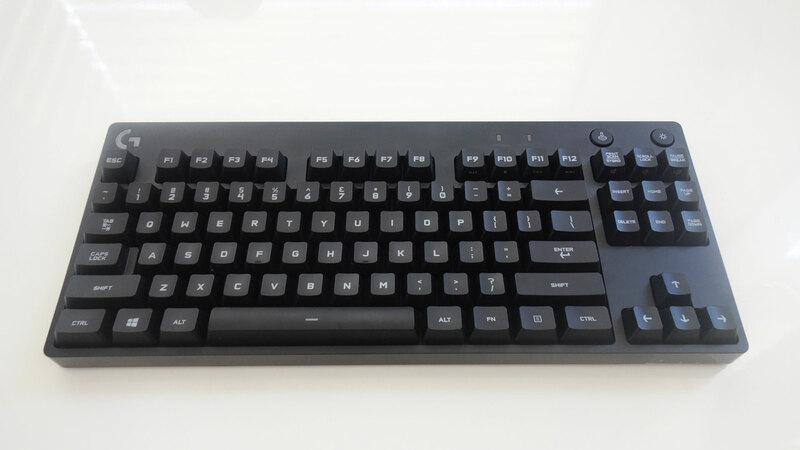 The keys of the G Pro are made up of the company’s own Romer-G switches paired with cylindrical keycaps. 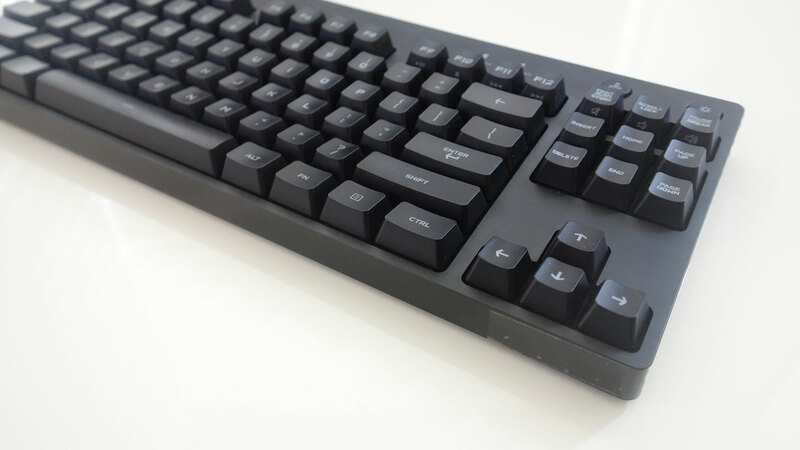 The keycaps are made from molded opaque plastic that are then painted black and laser etched. Logitech’s Romer-G switches are probably one of the more unique switches in the market as they feature a very different design from the usual Cherry MX switch or its clones or derivatives. The Romer-G switch features a square-shaped design that’s open in the middle to allow the LED to be positioned there so that the entire top of the keycap is lit up and there’s less backlight bleed on the undersides of the keycaps. The keycaps attach via 4-pin system on each side of the switch. Romer-G switches have an actuation distance of 1.5mm (shorter than the 2mm of traditional Cherry MX switches) and an actuation force of 45 grams (similar to that of Cherry MX Browns). The sound and tactile bump of the Romer-G switch is quite similar to Cherry MX Browns but unlike Cherry MX switches, Romer-G switches have a sort of landing pad at the bottom to soften the impact when the switch is bottomed out, an effect similar to adding o-rings to Cherry MX switches. Although, the Romer-G switches feel quite a bit softer when bottomed out, which also gives a feeling reminiscent of rubber dome switches so some users may not enjoy the loss of the signature clack when Cherry MX switches are bottomed out. Using the G Pro keyboard with the Romer-G switches felt great for both typing and gaming. 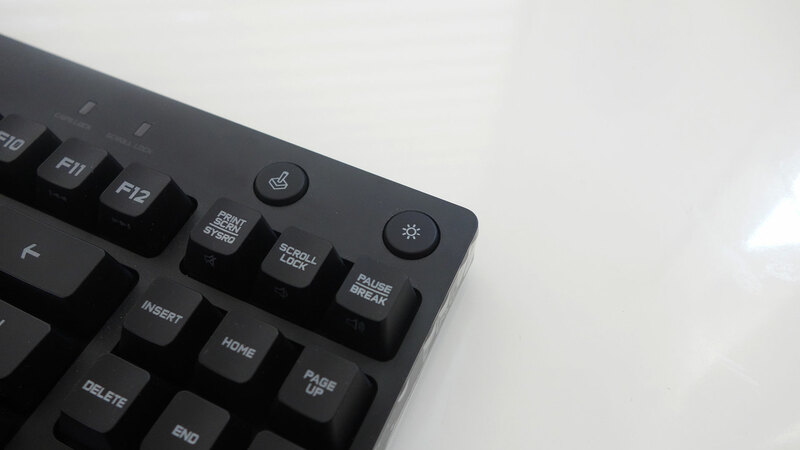 The lower actuation force and shorter actuation distance helped reduce fatigue during long typing sessions and we felt more confident that a key would activate even when pressing on them quickly, which is important for both typing and gaming. The previously mentioned softness when bottoming out the keys didn’t become much of an issue as it wasn’t very noticeable once we got used to the actuation distance and the tactile bump of the switches. The settings of the G Pro can be configured, as with all of Logitech’s other recent gaming peripherals, via the Logitech Gaming Software. Users are able to configure the function keys of the G Pro as macro keys, customize the RGB LED lighting and the Game Mode feature, as well as activate the heat mapping tool. Users can also activate other peripheral-specific settings such as allowing applications to control the LED lighting as well as creating configuration profiles for specific games or programs. The Logitech G Pro Tenkeyless Mechanical Gaming Keyboard has quickly become one of our favorite tenkeyless mechanical keyboards. The clean and sleek design, thoughtful features such as the detachable three-pronged usb connector and dual-level feet, fully customizable RGB lighting, and the company’s Romer-G keys all make for a simple yet complete package. And with a price tag of only PHP5,650.00 on Lazada, it’s one of the more affordable premium mechanical TKL keyboards with fully customizable RGB lighting in the market. Anyone looking for a portable, full-featured, tenkeyless mechanical keyboard should definitely check out the Logitech G Pro.